After my little survey on Instagram, I promised you I would share this recipe. The big advantages are that it can be suitable for everyone and can be used for both sweet and savoury crepes! You can always add a little sugar to the batter if you wish. Personally, I always prefer less sweet, knowing that you can add sugar to the crepe and that’s more than enough! If you have a food processor, mix all the ingredients and proceed to step 3. In a bowl, add the cornstarch and the eggs. Mix it up. Mix first, then gradually add the milk, while mixing the preparation so that it does not make lumps. Add a little rum (to suit your taste). Mix the mixture well: the cornstarch tends to fall back and harden a little. Heat your pan and oil it with a brush if necessary. Once hot, pour a ladle of batter into the pan. Cook the crepe for about 2 minutes. With a spatula, turn and cook the other side. The batter won’t brown much when cooked, it’s normal! If you wait for it to colour, it may overcook and become a little too hard. If so, don’t panic, once cooked, cover the pancake to soften it a little. 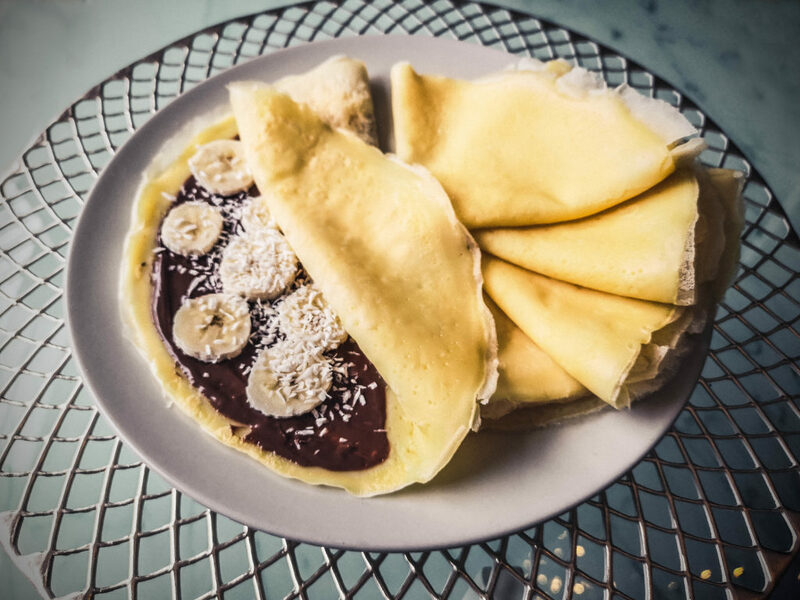 In a sweet version with a little jam, a little maple syrup or super gourmet with chocolate spread, banana and a little grated coconut! In a salty version with an egg, ham and cheese. Or filled with mushrooms in béchamel sauce. Sweet or savoury crepes, it’s up to you!